This feature is provided through optional plugins that are only included in the Full preset available from the official CKEditor Download site. You can also add them to your custom build with online builder. The optional Color Button plugin provides the ability to define font and background color for text created in CKEditor. When enabled, it adds the Text Color and Background Color toolbar buttons that open a color selection drop-down list. If you want to quickly remove colors from your document, use the Remove Format button provided by the Remove Format plugin. 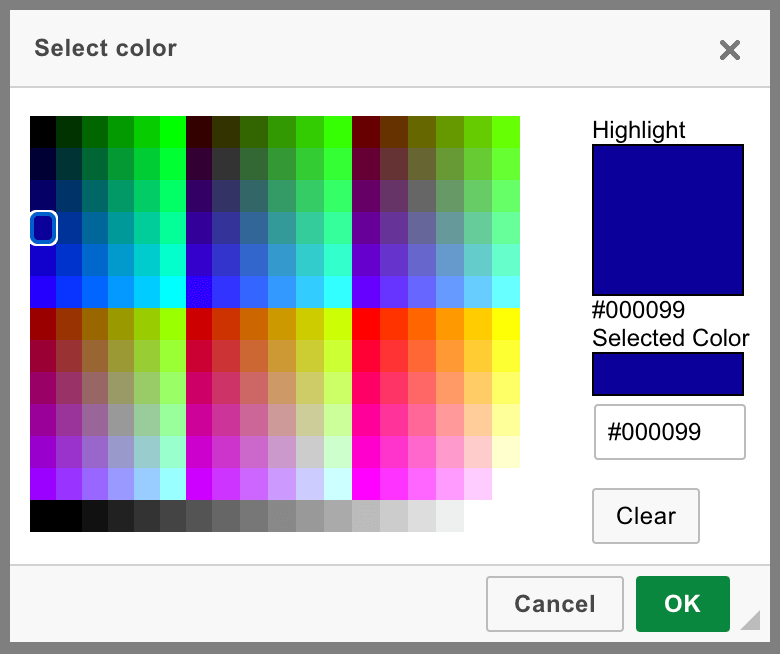 You can also add the optional Color Dialog plugin which extends the color selector with the More Colors option and a user-friendly way to select the desired color through a dedicated Select Color dialog window. When this plugin is enabled, the More Colors option appears automatically for the text and background color. You can hide the More Colors feature by setting the CKEDITOR.config.colorButton_enableMore configuration option to false. The list of colors available in the color selectors can be customized, for example to include the colors that are used in your website. You may also want to limit user’s choice of colors to just selected few in order to avoid the overuse of colors. Additionally, since CKEditor 4.5.8 you can also disable the “Automatic” option by setting the CKEDITOR.config.colorButton_enableAutomatic option to false. The Text and Background Color feature does not create semantically meaningful content. Even if you adjust the color list to match the style of your website, your users will be able to arbitrarily apply colors to text elements without any consistency. See the working “Setting Text and Background Color” sample that showcases the usage and customization of the text and background color features. The Using the Copy Formatting Feature article explains how to copy text formatting between document fragments. The Removing Text Formatting article explains how to quickly remove any text formatting that is applied through inline HTML elements and CSS styles. The Basic Text Styles: Bold, Italic and More article explains how to apply bold, italic, underline, strikethrough, subscript and superscript formatting. The Applying Styles to Editor Content article discusses creating more semantically correct text styles. The Applying Block-Level Text Formats article presents how to apply formatting to entire text blocks and not just text selections.